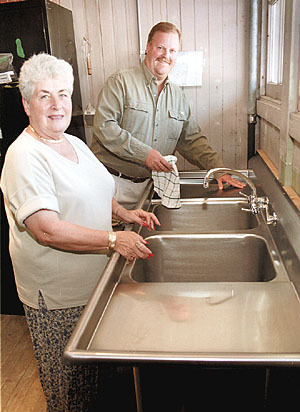 Stevenson Donates Sink for Train Station. he Santa Clarita Valley Historical Society has received many donations in the past. That is, almost everything but the kitchen sink. Last week, however, Jeff Stevenson of Lennar Corp., Stevenson Ranch's master developer, and the corporation itself donated the kitchen sink to the society  literally. Sue Yurosek, the historical society's restoration chair, accepts the donation of a new kitchen sink from Jeff Stevenson, at the Saugus Train Station in Heritage Junction. Stevenson was told about the society's urgent need for a sink several months ago after he visited the museum at the Saugus Train Station at William S. Hart Park, where members hold their monthly meetings. While at the museum and talking with volunteers, he said, he was told that the sink there was moldy and had been flooding the floor for months because the hot water heater was leaking. The rusty porcelain sink, said Sue Yurosek, the society's restoration chair, was installed at the station about 60 or 70 years ago and has not been replaced since. The cost to replace the sink, Yurosek said, would have had to come out of the nonprofit organization's operating budget. The organization, which is dedicated to the preservation of the SCV's rich history, operates solely from minimal membership fees, private donations and fund-raisers, she said. Upon hearing the organization's predicament, Stevenson offered to donate the funds through Lennar to replace the faulty sink. Stevenson and Lennar soon joined forces with Kurt Boehmer Plumbing in Santa Clarita to install the new sink  free of charge. "It's very, very nice we got (the donation) so our funds can pay for other things," Yurosek said. The new stainless steel, molded, double sink, Stevenson said, cost Lennar about $1,000 and cost the plumbing company a day's labor. The trio's efforts have not been lost on the members of the society. "It's beautiful," Yurosek said. "They saved us at least $1,500. It was a sizable donation they made to us." The new sink, she said, is not part of the organization's ongoing efforts to restore the station which was operational from 1887 through the 1970s. "There's a lot of original stuff in the train station," she said. The museum there is located where the original baggage compartment was located, Yurosek said. The meeting room is located where the freight room was originally located, and the station contains an original telegraph machine. To date, the train station, Yurosek said, "has been pretty much restored." In addition to the group's efforts to restore the station, members are focusing on the restoration of several historic buildings located in Heritage Junction, including the Pardee House, the Newhall Ranch House and the Kingsbury House. Funds needed to restore the Pardee House may come from a fund-raiser, Yurosek said. The Newhall Land & Farming Co. has donated funds to restore the Newhall Ranch House, and the Kingsbury House is close to completion, she said. About 3,000 local schoolchildren take tours of the historic sites at the Junction, including the nearby train station, each year, Yurosek said. "I hope we do get it completed," she said of the ranch homes. "It's something that's fascinating for children. It's going to be a wonderful area for history, for remembering." "I just think we're really fortunate that people have the foresight to save those historical sites such as Mentryville and the ranch homes that are being restored at the county park because it saves some of the history that would have otherwise been lost," he said.